WILLEMSTAD – The MFK stands firm on their standpoint that they will not meet with Etienne Ys in the information round. This is according to the MFK leader Gerrit Schotte in a letter to the ‘informateur’ Ys. 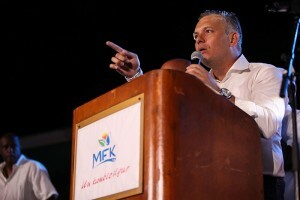 According to Schotte, it is not a good idea to talk because of the several media reports which indicate that there is already a government agreement between the three parties PAR, MAN and PIN. The candidate-ministers have already been announced by the parties. In addition, Schotte informs the ‘informateur’ that he holds the PAR responsible for economic stagnation and mass layoffs. The MFK is not confident that the parties PAR, MAN and PIN as PNP's surrogate, will be able to solve the socioeconomic problems of Curaçao.